Cigarette packaging is about to lose volume in the U.K. and in France, as both countries follow Australia's lead with regulations forcing plain cigarette packaging in 2017. And Canada is moving closer to parallel these regulations. "Over the past 10 years we've seen the industry constantly innovate," Melodie Tilson, policy director for Non-Smokers' Rights Association tells The Current's Anna Maria Tremonti. "What it's been doing with packaging when all other, or most other, forms of promotion are banned. The packaging becomes the most important promotional vehicle." In 2012, Australia took away all branding from tobacco companies and smoking rates there have since declined. The federal government is currently considering a "plain packaging" rule for tobacco products. "No colours, no logos, no slogans," says Tilson. "None of the things that the industry uses to detract from the warnings, and also to convince smokers that certain brands or brand variants are less harmful than others." Imperial Tobacco's head of external and corporate affairs Eric Gagnon tells Tremonti "plain packaging is not going to work." "The reason that plain packaging is being discussed in Canada has nothing to do with public health. It has nothing to do with that. It's because there's a number of anti-tobacco lobbyist group that for them plain packaging is important and that's the truth. " Gagnon argues plain packaging will make it easier for counterfeit tobacco manufacturers to copy and says no other industry would accept this kind of packaging. "As any legal company in this country, we believe we have the right to have trademarks on our brands." Big Tobacco along with Reynolds subsidiary, Northern Brands International Inc., North-Carolina-based R.J. Reynolds Tobacco Co, Imperial Tobacco Canada Ltd., Rothmans Benson & Hedge and JTI-Macdonald Corp, were fined a collective $1.7 million in illegal trafficking fees by the federal and provincial government in 2010. This scandal was called one of the biggest corporate fraud in Canadian history by the RCMP. When pressed on this, Gagnon told Tremonti this was an "old story." "The government has the right tomorrow morning to make [smoking] illegal, but then as a society we need to accept that people will not stop smoking and 100 per cent of the market will be illegal." 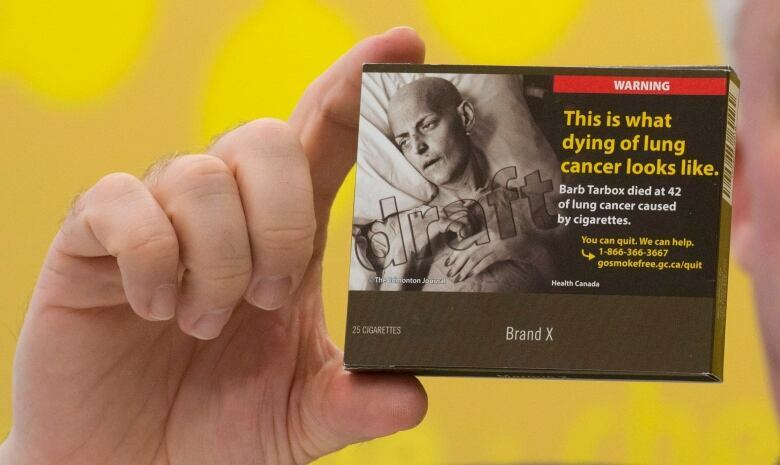 Former minister of health for Australia Nicola Roxon tells Tremonti tobacco companies have a "playbook" when it comes to fighting back against plain packaging and the push back from Canadian tobacco companies is similar to what happened in Australia. "In Canada there's 37,000 people that die every year from tobacco related disease in history." "That's why I'm here to correct the record and to support the moves in Canada to introduce this measure. We don't want young people taking up a habit that will curse them for life," says Roxon. "My message to Canada is this did work in Australia, stay firm in your focus." Listen to the full conversation by pressing the play button at the top of this post. This segment was produced by The Current's Shannon Higgins, Willow Smith, Julian Uzeilli and Jacqueline McKay.